1. Grab your bag AND your current read. If you are using an eReader, phone, or computer that goes with you in your bag, make sure to include it! 2. 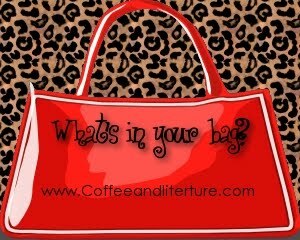 Take a picture (or pictures) of the contents & bag, including your current read. It can be a picture where you just dump everything out of the bag and snap a pic, or you can neatly arrange everything. Your choice! 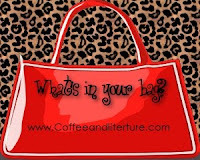 For some ideas on pictures check out the What’s in your bag? Flickr group. 3. Tell us what you are carrying in your bag in your post. You can label the picture or just describe it. 4. Tell us a little about your current read…title, author, how much you’ve read, a short review so far, some quotes, etc. 5. POST A COMMENT with either the link to your own “What’s in Your Bag?” post, or share a link to the bag’s picture (if you don’t have a blog). I’ve swapped bags quite a bit these past few weeks, but I’ve settled into my favorite bag for a while. I’m starting to carry my Roots Small School Bag as my main bag. It’s big and can hold quite a bit, so I opted to use it for a while. 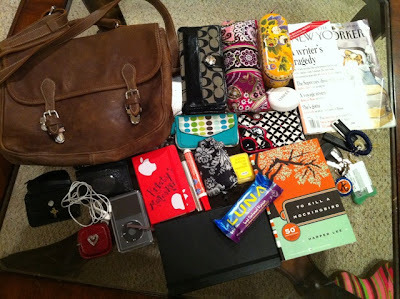 Below is my “What’s in Your Bag?” picture for this week. As you can see, this bag fits quite a bit. As for my current reads, I am reading several books, but I’ve been working dilligently on To Kill a Mockingbird since it is Banned Books Week 2010. I’ve read Mockingbird before while in high school and one or two times after, but I am really liking it much better this time around. I’m only on Chapter 5, but I’m really enjoying it. To make a small mention of The New Yorker magazine, I have actually not read the articles yet! Sad, I know, but I’ll get to them eventually! Leave a comment with your own “What’s in your bag” post!